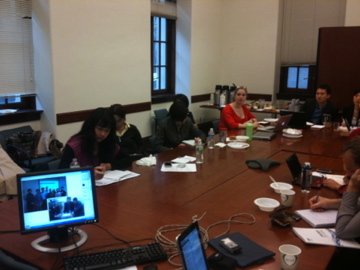 Professional Fellows at Baruch College attending a remote presentation by Climate Interactive. Climate Interactive is proud to have presented to participants in the Professional Fellows Program. These climate change professionals from Australia, China, Indonesia, and Japan are visiting the US to learn about US-specific climate change activities and organizations. They are experts in mitigation, carbon markets, adaptation, and REDD. Climate Interactive presented the C-ROADS CP simulator (Windows-only) and our other simulators that can be found online. The remote presentation led to rich conversation about a variety of climate topics. Fellows shared their thoughts about C-ROADS and the simulators as we explored climate change topics such as US public opinion, climate science dynamics, and the value of industrial sector carbon accounting. Here is a photo of the some of the Fellows in their conference room at Baruch College during the Climate Interactive presentation. The Professional Fellows Program is sponsored by the US State Department and this Fellows cohort is being hosted The International Center & Baruch College (CUNY).